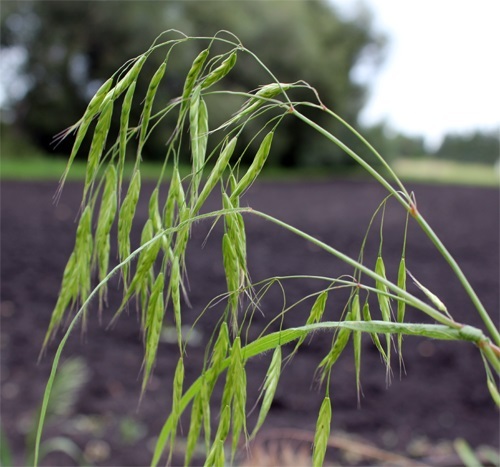 Japanese Brome originates from Pakistan, central Europe and Eastern Japan. Japanese Brome outcompetes native vegetation and can slow down succession on reclamation sites. This invasive grass can grow up to 90 cm. Japanese Brome flowers are drooping and one-sided. The awns are 8-10 mm long and are sometimes bent at full maturity (awns are the hair-like ends of the individual grass seeds). The first glume has three 'nerves' - a glume is the leaf-like structure at the bottom of the seed heads. The grass is usually covered with hairs with the exception of the main stem within the panicle (the branching cluster of flowers). Please keep your eyes out for it and report to invasiveweeds@edmonton.ca when in doubt.